We would like to wish good luck to all the pupils representing S.N. 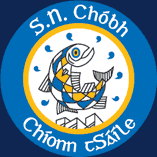 Chóbh Chionn tSáile who are taking part in Cork City Sports today – 21st May. It is great to see the sun shinning for the event. Go n-éirí libh go léir! To the Communion Class of 2014 – we wish you all a very Holy and happy day tomorrow – Saturday 10th May. We look forward to welcoming the children and their families to a ‘post Communion get together’ at the school after the ceremony.